This exercise isn't as scary as the title above makes it sound! The idea is to display an image next to each film, according to whether it's short (under 2 hours), medium (2-3 hours) or long (3 hours +). 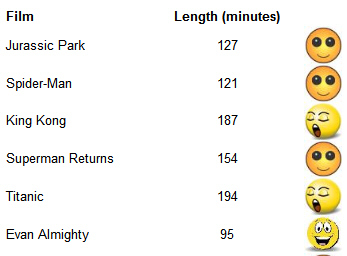 This person clearly isn't a film buff: the shorter the film the better. Thoughts on how to go about doing this are shown below! Right-click on the Images category, and choose to add 3 images from the folder shown at the start of this exercise (they've got PNG extensions). You can write your code for the custom assembly using either VB or C# - the choice is yours! Click on the expression builder tool to set the source for this image to be the results of your function. 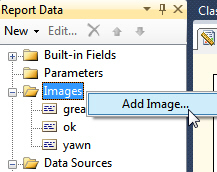 Check that your images look correct in your report!